Creatine monohydrate is one of the most effective and most studied supplements on the market today. It is the most cost effective supplement in terms of muscle mass and strength gains. Basically, creatine is an ‘osmotically active substance’. It pulls water into our muscle cells, which in turn, increases protein synthesis and therefore, leads to better recovery times and increased muscle gains. Throughout this article, I’m going to show you the benefits of implementing creatine into your supplement plans and explain the dosages you should be taking. Firstly, let’s get rid of some myths and stigmatism’s that surround creatine monohydrate. People ask me quite frequently whether or not creatine will mess with their kidneys or if it will make them look bloated ? The simple answer to this is no. As previously mentioned, creatine is the most studied supplement in the fitness world to date and there has never been a definitive study to back up either of these myths. Water retention is inevitable when taking creatine (that’s why we take it), but it’s intracellular. It is inside the cell. So, as a general rule, it will give the muscle the appearance of being fuller and harder. It will not make you look bloated so long as you are working out and training! Similarly, blood testing after taking creatine and finding creatinine in your body is where the myth of kidney damage comes from. People argue that finding creatinine in your bloodstream could possibly be damaging the kidneys. This is simply not true. Finding creatinine in your blood stream after taking creatine simply shows that your kidneys are working and that they are breaking down the creatine as they should be. If you were to take a urine test and find elements of creatinine in your urine sample, this could indicate that your kidneys are not breaking down the creatine, however, throughout all of the studies done on creatine monohydrate, this has never happened. So, is creatine safe? Yes! So long as you have a healthy body and your kidneys are working fine (you’d know if they weren’t), creatine monohydrate can be utilised by all athletes to increase their performance. Creatine monohydrate powder and measure spoon on a yellow tablecloth. 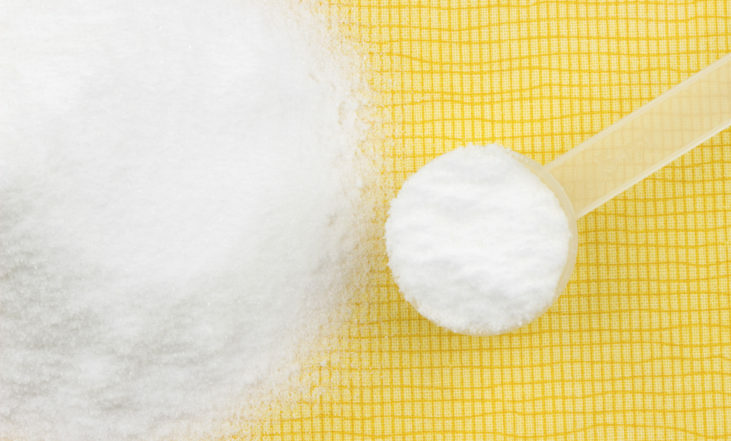 Now that we have dispelled the common myths surrounding creatine, let’s take a deeper look into how our bodies can benefit from taking creatine monohydrate. Taking creatine will increase the amount of Adenosine Triphosphate (ATP) in our bodies. The ATP system or the ‘phosphate system’ is the energy system used to create very fast or explosive muscle movements for a short period of time. The ability to do this is imperative for those of us wanting to increase strength and muscle mass as the more reps / higher weight we can manage, the more our muscles will work. As a result of this, the stronger your muscles will become. There are many different thoughts on how to take creatine to get the best results. There are arguments that support a loading phase and arguments that support a simple method of 5 grams per day. Studies have shown that at the end of a 4 week period, the difference in creatine levels of those that had taken 5 grams per day and those that had ‘loaded’ showed little to no variations. So, in my professional opinion, it is quite simple. Take 5 grams per day! Creatine works on a saturation basis, therefore, it’s not a matter of when you take it throughout the day, it’s simply that you DO take it. I tell my customers to mix it in with their post workout shakes, that way, it will become routine and you will never forget to take it. I suggest to my customers that they take a creatine supplement that is at least 99% pure. This is to ensure that you are getting the most value for money and the best possible delivery of creatine into your body that is on the market today. I hope this article has helped further your knowledge on creatine and explained some rumours that you may have heard around the gym. The biggest point to take away from this article is to take 5 grams of creatine monohydrate per day and your body will thank you with some well deserved results!